The J-pole is actually might be a bit deceiving. 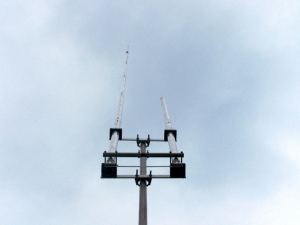 From a electrical point of view it is a halve wave antenna, but mechanical it’s a ¾ wave antenna. The “boundaries” can be clearly seen. If you watch closely, you can divide the J-pole in two pieces. Those two parts, we are going to refer to as : the radiating part and the “matching” stub. 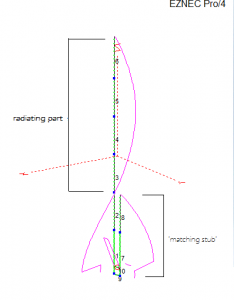 The ”real” radiating part, is the part of the antenna which consist out of the single rod, the top part of the antenna. That matching stub is the lower part of the antenna. The two rods being parallel to each other. These tubes are approximately a quarter wave length long. And act as a impedance transformer. The high impedance at one end (end of single rod) is transferred to 50 ohms at the other end (where we connect our coax). In the matching stub we see two currents with opposite direction. Because of that the total sum of the current is zero and therefor the bottom part is not radiating. You could think of it as two people pulling a rope….there sure is “energy” but it isn’t “focused” in one direction. In essence its a halve wave end fed dipole ! In essence it is thus a halve wave end fed vertical. This of course being a very famous antenna on the CB. We see them in many varieties : antron 99 / GPA / etc. Lately the name “hy end fed” has received quite some attention in the HAM community. Funny to see the attention the antenna gets with a different name. The biggest difference between the J-pole and “those others” is the method of feeding. 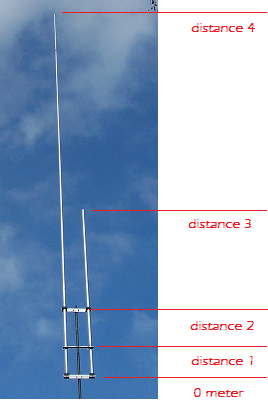 A normal Dipole would have its feed point at the centre of the antenna. All the “hy-end fed antennas types (a-99 / gpa) feed the antenna at the bottom. At that bottom point there exist a high impedance (< 1000 Ohm) those antennas often use coils to “transfer” that high impedance down to 50 ohms. Instead of a coil we are going to use that two tube matching stub. The amount of power is almost unlimited. No loss in “bad” coils. The radiating part has moved up higher because of that matching stub. 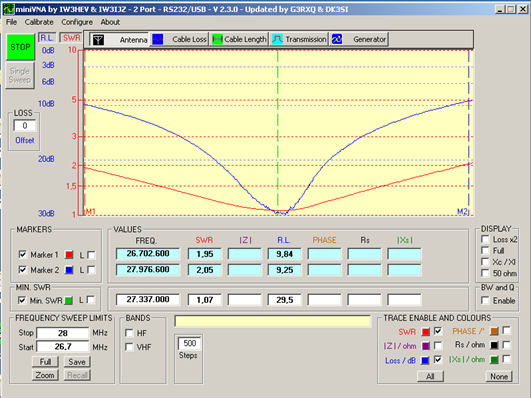 This definitely is noticeable on 27 Mhz. Simplicity…it is very difficult to make mistakes, it’s so simple things can’t go wrong. You could DC ground the antenna if one pleases. In theory all end fed halve waves supposed to be equal. However in real life you often can notice differences. This is mainly due to the additional height of the J-pole (that definite is noticeable) and there are many end fed halve waves which are not made that well, and there for include losses. And NO, it doesn’t mather how great your antenna manufacturer is. Differences between those halve waves can only be real do to internal losses. Halve waves antennas with 9,9dBI etc., are just not possible, just as growing younger isn’t. 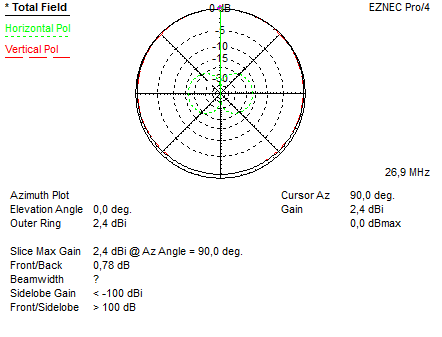 Eznec has difficulties interoperating close spaced wires (as a j pole is). If you modell yourself, or you know a manufacturer who does, ask them about the average gain figure of the model. That will indicate how well the model is. It’s a “way to verify” the accuracy of the model. The “figure” should be 1. For this version of the J-pole we used the NEC4 engine. A more enhanced version. BUT DOWN BELOW WE WILL NOTICE THE J-pole does more than 2,1 dBI ? Well yes, and that figure (2,4dBI) is accurate. 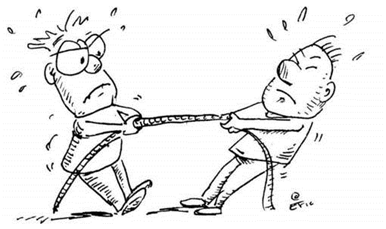 We just said that the “matching stub”, always has some “unbalance”. That results that not all currents in the bottom will be cancelled. Some will influence the pattern. The reason for that unbalance is primarily cause one end of the J-pole has the “radiating part” on top and the other part doesn’t. For that reason the pattern of the J-pole is slightly “bend”. A peak gain of the pattern can be expected around 2,4 dBi. There are quite some varieties on the J-pole. There is a version where the total length is about a meter shorter, the matching stub just slightly longer. That version has a wider SWR bandwidth response. But there are many more versions: The slim jim probably being the one best known. 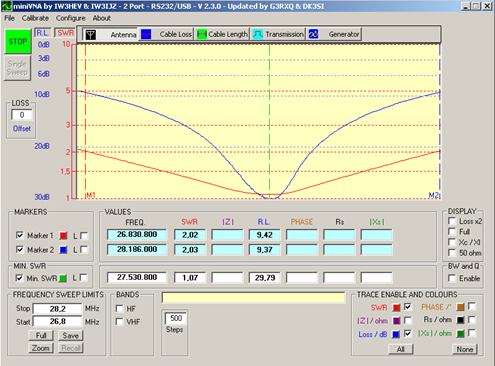 It has still the SWR bandwidth we need to operate (CB and DX portion) and it is higher compared to those other versions. 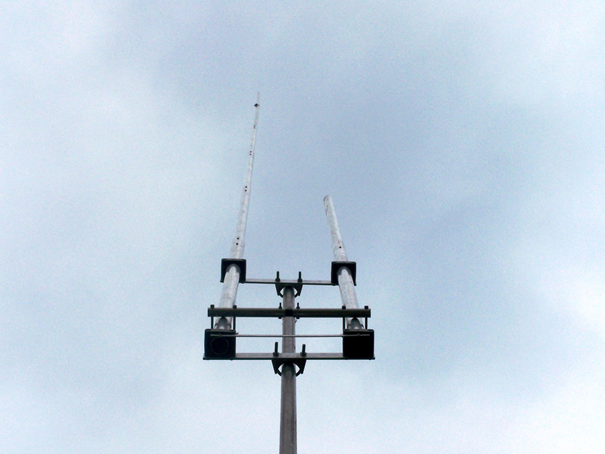 Probably you will use the antenna for “local CB” traffic. Antenna height is important. 1 meter (+/- 3feet) additional height, can give you the edge of hearing a distance local station. Our traditional J-pole has a “better” horizon view compared to those others. In order to make sure this will be the best antenna, we have to work with the best materials. 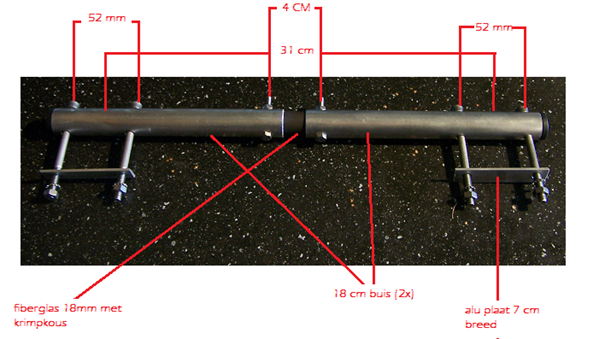 To give a rough idea: The antenna starts with 40mm diameter and ends with 16mm. Sirio for example starts with that 16mm (sy-3/sy-4). The antenna will certainly fall in the “heavy duty” section. Some stores deliver aluminium on length. In that case we do not need to “cut” the aluminium. 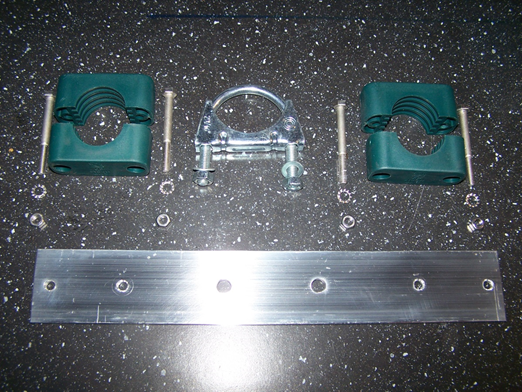 Now, you could attach all the aluminium tubes by just using the screws, and leave the hose clamps for what they are. However, personally I rather use both attachment methods. The holes we will drill are 3mm (otherwise our 3,5mm screws won’t fit tightly. If you do intend on using a saw, don’t forget to make a cut on the top of the tube, providing room for the hose clamp to “tighten” everything. 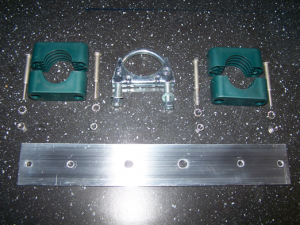 The plate is made out of 5cm wide and 5mm thick aluminium plate, with a length of 40 cm. You could make things bigger / thicker…not smaller..
A piece of advice: If you do not have “professional tools, a vernier a nail will help to get the holes “centred”. The nail for “hitting” on the right spot. That will leave a small hole in the aluminium. With the result that the drill will find the marked spot more accurate. Speaking of accurate, please be ! Otherwise the entire antenna will become not straight. The two element holders are placed: 1, 2cm from the bottom and the second about a meter from the bottom of the antenna. This is where our coax is attached. 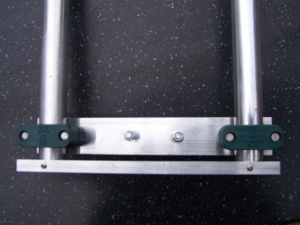 This tube is placed between the two element holders at approximately 20-30 CM from the bottom. The Fiberglas rod needs to be inserted in the aluminium tubes. Around the fiberglass, there is the shrink sleeve. At the end and at the centre. It is advice to use silicon spray to gently slide them inside the aluminium tubes…..be careful. And of course..don’t forget the 22mm end caps! At the bottom of the antenna you will need to make a electrical connection between the two vertical parts. For this i have use the 20×1.5mm plate. 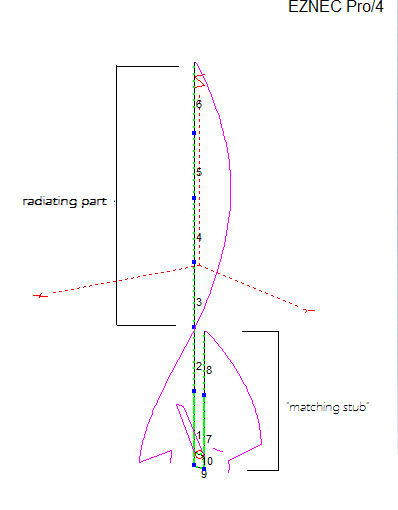 Both: The length of the radiating part as well as the matching tube length have influence on the SWR. 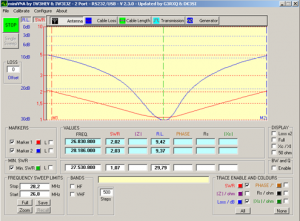 With the “fine tuning” you will be able to “set” the SWR to 1;1. Again advice is 20cm from the bottom. Picture “bottom 2”(27,337 The long radiating part needs to be 7,73 meter and the short part 2,78 meter. If you wish to make the resonant frequency lower, you can extend both tubes. (10cm is about 100 KHz) (7,93 /2,78 will bring you to 27,125 MHz). 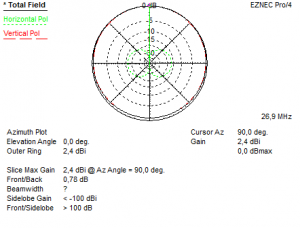 You will find a lot of information about a RF choke on the internet. By far all is accurate. Just to be on the safe side…for all other antennas you should place the RF choke as close to the feedpoint as possible. This is not the case with the J-pole. 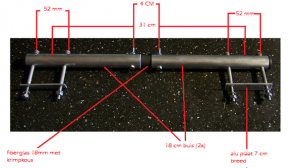 A RF choke (when made from RG213UBX) needs to be : 10cm in diameter and has 5 turns. Make sure you “water proof” everything with vulcanising tape. If you watch closely I have also added a bit of shrink sleeve. That is a securement that the tape will stay where it is. 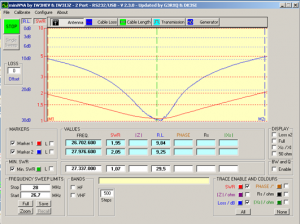 And your done…a choke >1000 Ohm for 27 MHz ! You could probably make one of these for less than 100 euros. For that money You will have a great antenna, which will last a life time. At HPSD: we sell them for around 170 euro. But in all honesty, it is far more fun constructing one your self. If needed you can also contact us for “difficult” parts. Have fun with the antenna !